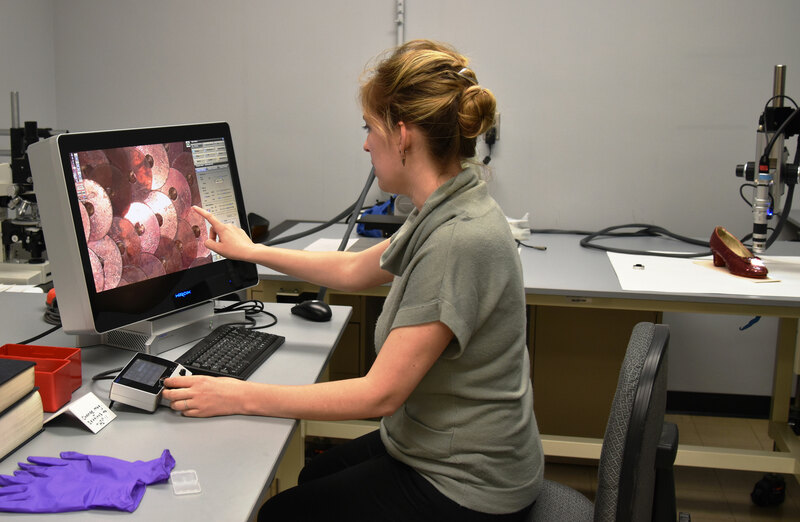 Wielding an adorably tiny vacuum, objects conservator Dawn Wallace peered through her stereomicroscope at thousands of 80-year-old red sequins. As the soundtrack to The Wizard of Oz drifted through the Conservation Lab, Wallace gently began vacuuming every single delicate sequin, carefully removing surface dirt with a soft brush and a pipette attached to a vacuum cleaner. 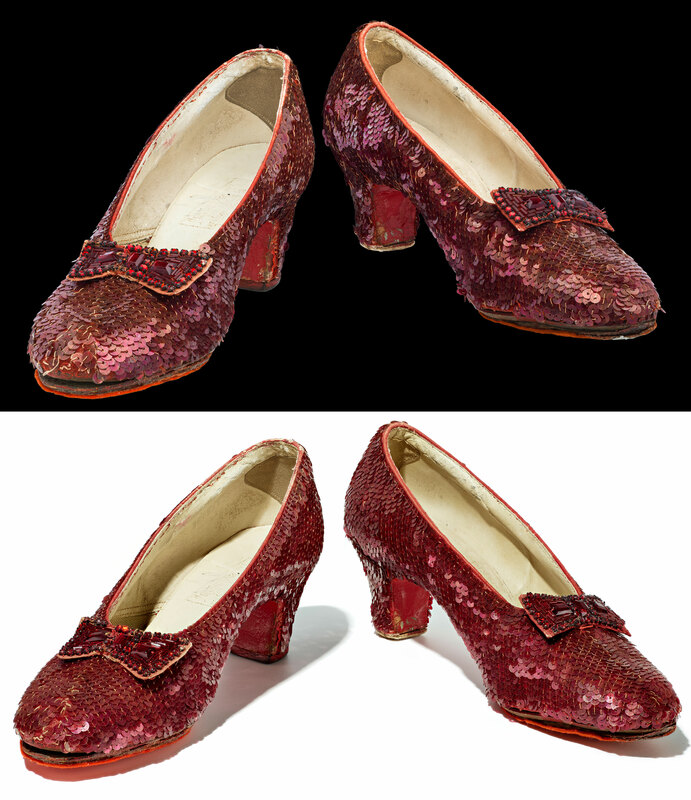 In a process that took over 200 hours, Wallace examined, cleaned, and stabilized Dorothy's Ruby Slippers from the 1939 movie, preparing them to go back on display in their own special gallery. 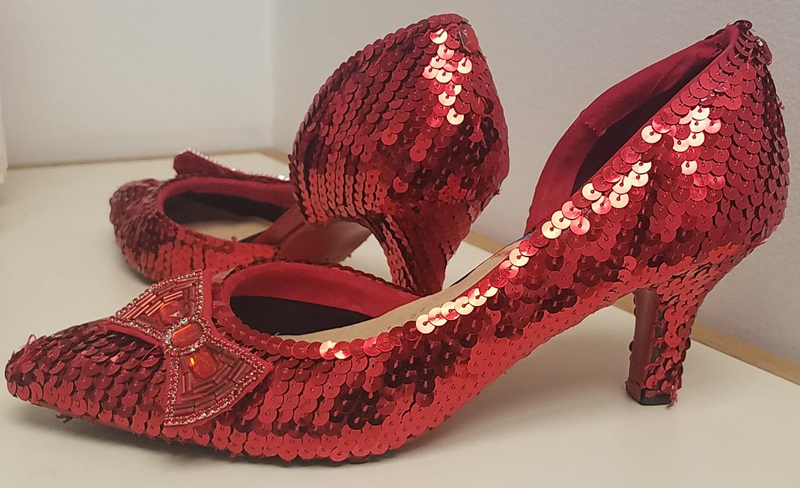 As the Ruby Slippers step back into the spotlight, here are five things to know about their journey through the Conservation Lab. Our Ruby Slippers before visiting the Conservation Lab (top) and after (bottom). With their renewed shimmer, we can't blame you for thinking Wallace artificially enhanced the look of the shoes worn by Judy Garland on the Yellow Brick Road. While they do shine a little brighter now, we assure you that they're the same pair. Wallace didn't add new sequins, touch-up the pair with paint, or replace missing beads—"improvements" or restoration were not used on this project. "The shoes are 80 years old, and we want to retain the history of their use," Wallace said. "Missing sequins or broken beads could be from the filming." Erasing that evidence was out of the question, but removing surface grime was an important part of her work. 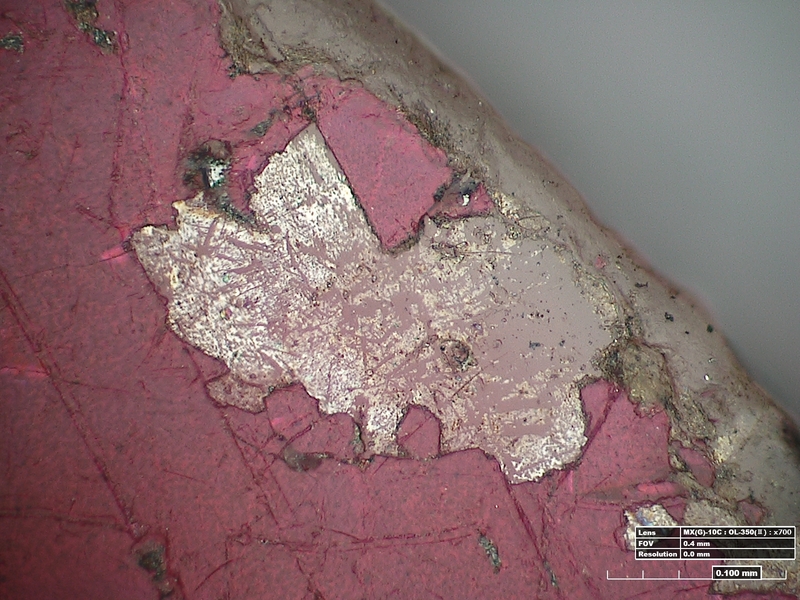 In this photo taken through a Conservation Lab microscope, it's possible to see where the color coating on the sequins is in less-than-mint condition. These shoes worked hard—Garland likely wore them in dance scenes, the felt on the bottom muffling the noise of her steps—and that's history we're proud to preserve. Cleaning the glass beads on the bows created a particularly dramatic before-and-after difference, revealing glistening, shiny red glass beads where there had been a hazy burgundy color before. 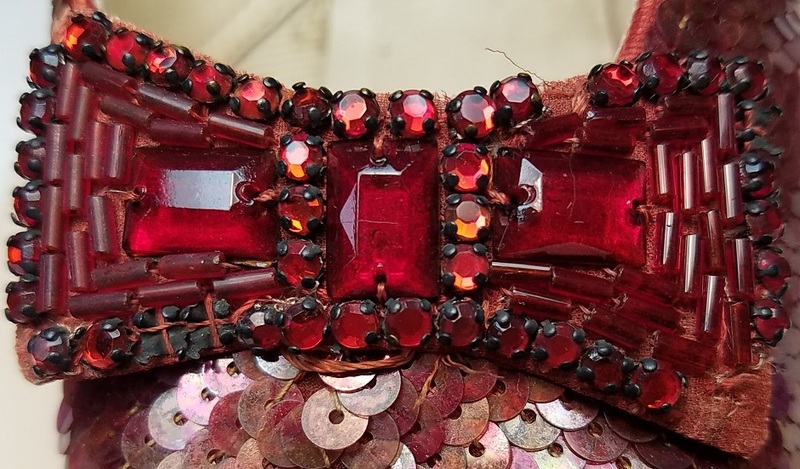 In this photo taken during treatment, the left section of this bow from the Ruby Slippers has not been cleaned. The right side has. After cleaning, Wallace took an even closer look at how each sequin is attached to the fabric covering the shoe, checking 80-year-old thread for any sign of weakness. Where she discovered weak thread, she reinforced it with an appropriate adhesive or fine hair silk that provides stability. You'll only be able to spot these stabilizers in very close-up photographs. Without a very close look, you might miss Wallace's handiwork. 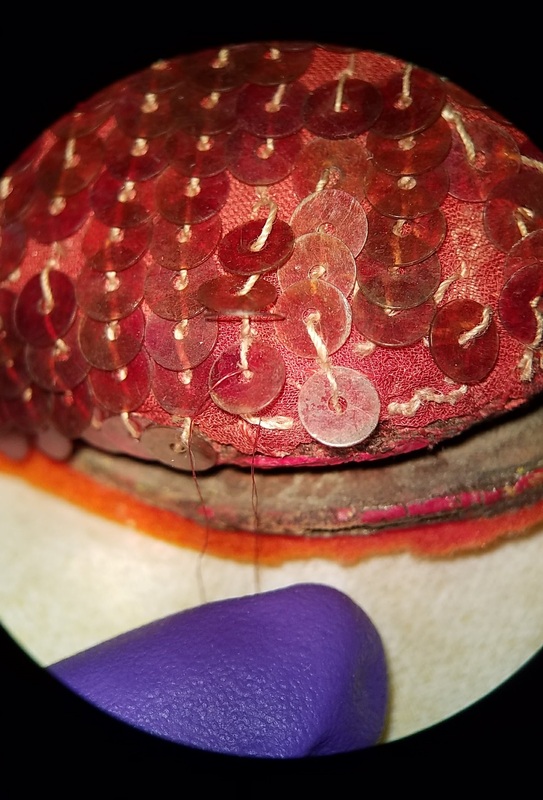 This sequin's thread showed signs of weakness, so she secured it with a silk thread to provide stability that will allow the shoes to be on display for years to come. While you may never appreciate the thread in the Ruby Slippers, Wallace said that examining it was one of her favorite parts. "That's where you see the really human touch," she said. Multiple pairs of Ruby Slippers were made for The Wizard of Oz, and different costumers might have subtle differences in their work and sewing skills. Wallace examines the sequins of the Ruby Slippers. Looking even closer, Wallace discovered that each sequin has multiple layers. A reflective silver layer under the top coating gives the red its special reflectance—but over the years, some sequins had flipped the other direction or rotated out of the original position. Using tweezers covered with Teflon to protect the delicate, scratch-prone surface, Wallace gently realigned individual sequins when possible and necessary, revealing their reflective side. This gentle realignment of certain sequins also helped the Ruby Slippers regain their sleek appearance. The shoes were commercial Innes heels purchased by costumers and covered with red fabric onto which they'd sewed red sequins in bias rows, creating a sleek appearance in which all of the sequins lightly overlap and lay smoothly. Realignment allowed many sequins to regain their rightful position in relation to their neighbors. If a sequin were sewed on too tightly to realign or the process might endanger a sequin or thread in any way, Wallace left it alone. Examining the shoes to better understand their construction was an important step for Wallace. Handling the shoes without touching the sequins was a huge challenge, Wallace reports. Spending hundreds of hours working on objects you can only manipulate in certain ways presents challenges, but Wallace quickly learned how to safely handle the shoes. She also created special mounts to support the shoes during treatment. For Halloween, Wallace decorated her own pair of shoes with sleek rows of sequins, just for fun. 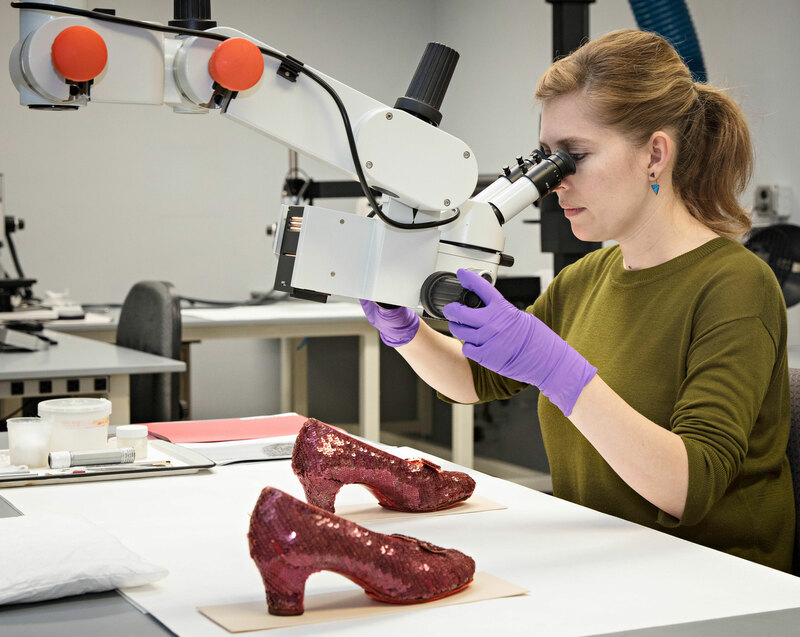 After spending over 200 hours working with the Ruby Slippers, Wallace confesses that, while she is glad the Ruby Slippers are back on display, she misses having them around the Conservation Lab. Perhaps that's why her Halloween costume this year included a pair of red heels onto which she attached rows of sparkling red sequins. "After working with the real thing for so long, I just had to try my hand at sequinning my own pair of Ruby Slippers," Wallace said. In this video, Wallace shares why she'll miss having the shoes around the Conservation Lab. Erin Blasco manages the museum's blog and social media outreach.